^ a b c d Gainor (2001), pp. 93, 97–99. ^ a b Hacker & Grimwood (1977), pp. XV, 75. ^ a b Murray & Cox (1989), pp. 33–34. ^ Reguly (1965), p. 7. ^ Farmer & Hamblin (2004), pp. 51–54. ^ Gatland (1976), p. 42. ^ a b Dryden (1964), p. 362. ^ Tomayko (1988), pp. 10-19. ^ "Orbital Rendezvous". Buzz Aldrin. Retrieved 2011-10-09. 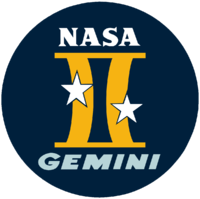 ^ "NASA, Project Gemini". NASA. Archived from the original on 2004-11-07. Retrieved 2011-10-14. ^ Wilford, John Noble (July 1969). We Reach the Moon. New York: Bantam Books. p. 67. ^ Lafleur, Claude (2010-03-08). "Costs of US piloted programs". The Space Review. Retrieved February 18, 2012. Farmer, Gene; Hamblin, Dora Jane (2004). First On the Moon: A Voyage With Neil Armstrong, Michael Collins and Edwin E. Aldrin, Jr. Boston: Little, Brown and Company. ISBN 978-0-7607-5510-5. French, Francis; Brugess, Colin (2007). In the Shadow of the Moon: A Challenging Journey to Tranquility, 1965-1969. Lincoln, Nebraska: University of Nebraska. ISBN 978-0-8032-1128-5. Gainor, Chris (2001). Arrows to the Moon: Avro's Engineers and the Space Race. Burlington, Ontario: Apogee Books. ISBN 978-1-896522-83-8. Hacker, Barton C.; Grimwood, James M. (1977). On the Shoulders of Titans: A History of Project Gemini (PDF). NASA SP-4203. Washington, D.C.: National Aeronautics and Space Administration. Retrieved 2015-01-02. Harland, David M. (2004). How NASA Learned to Fly in Space: An Exciting Account of the Gemini Missions. Burlington, Ontario: Apogee Books. ISBN 978-1-894959-07-0. Retrieved 2015-01-03. Kranz, Gene (2001). Failure Is Not an Option: Mission Control from Mercury to Apollo 13 and Beyond. New York: Simon & Schuster. ISBN 978-0-7432-0079-0. Retrieved 2015-01-03. Murray, Charles A.; Cox, Catherine Bly (1989). Apollo: The Race to the Moon. New York: Simon & Schuster. ISBN 978-0-671-61101-9. Tomayko, James E. (1988). "The Gemini Digital Computer: First Machine in Orbit". Computers in Spaceflight: The NASA Experience. Washington, D.C.: National Aeronautics and Space Administration. Retrieved 2015-01-04. Agle, D.C. (September 1998). "Flying the Gusmobile". Air and Space Magazine. Washington, DC: Smithsonian Institution. 12 (4). Archived from the original on 11 October 1999. Retrieved 2015-01-03. Agle, D.C. (September 1998a). "Riding the Titan II". Air and Space Magazine. Washington, DC: Smithsonian Institution. 12 (4). Archived from the original on 16 April 2014. Retrieved 2015-01-03. Burkey, Ronald (2012-01-08). 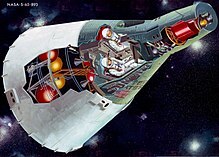 "Gemini Spacecraft On-Board Computer (OBC)". Archived from the original on 2015-01-04. Retrieved 2015-01-04. Dryden, Hugh (March 1964). "Footprints on the Moon". National Geographic Magazine. Washington, DC: National Geographic Society. 125 (3): 357–401. Retrieved 2015-01-04. Loff, Sarah (2013-10-21). "Gemini: Stepping Stone to the Moon". Gemini: Bridge to the Moon. Washington, DC: National Aeronautics and Space Administration. Archived from the original on 2015-01-04. Retrieved 2015-01-04. Reguly, Robert (1965-09-03). 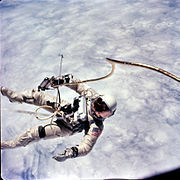 "Canadians who helped Gemini 'Go'". Toronto Daily Star. Toronto. p. 7.